Sunny. High 71F. Winds N at 10 to 15 mph.. Girls hand off in the 4x100 relay March 28 at Bridgeport. Taylor Connor, Republic, clears 6-2 in a meet earlier this year at Deer Park. Runners round a turn in the 4x100 relay at Bridgeport on March 28. CASHMERE - The Okanogan High School girls' track team easily swept first place at the 18-team Cashmere Invitational on April 13. The girls finished with 105 points, outdistancing second-place Cashmere at 69. Cashmere won the boys' title with 82 points. The Okanogan boys were third at 67 behind second-place Meridian at 76. “We had a very good meet at the Cashmere Invite,” Okanogan coach Marty Staggs said. “Tough conditions, windy and rain for the first half of the day. Still we had some great times and throws. Okanogan’s Kendra Sachse placed first in the javelin in a personal record 146-9. Omak’s Emma Haeberle set a personal record and took first in the high jump at 5-0. Liberty Bell boys - Emerson Worrell: 3, 400, 53.67PR; 7, 800, 2:16.14. Magnus Treise: 5, javelin, 145-00PR; 6, triple jump, 20-1, PR. Liberty Bell girls - Icel Sukovaty 3, 3000, 11:30.19. Keeley Brooks 7, 800, 2:35.94. Caitlyn Cooley 5, shot put, 30-00.50; 9, discus, 73-4 PR. Ava Mott 9, long jump, 13-3PR; 9, triple jump, 29-00; 9, 800, 2:41.68. Chloe Sprauer 10, long jump, 13-1 PR. Sammy Curtis 10, shot put, 27-00.25. 4x100 relay 5, 54.46, Curtis, Ali Palm, Sally Thornton-White, Sprauer. 4x200 relay 4, 1:54.61, Curtis, Thornton-White, Palm, Sprauer. 4x400 relay 4, 4:43.66, Brooks, Thornton-White, Palm, Sprauer. Oroville boys - Jerry Milholland 6, 100, 11.86. Seth Baugher 7, 100, 11.92PR. Carson Allie 9, pole vault, 9-00 PR; 16, long jump, 16-10.75. Oroville girls - 4x100 relay 8, 57.27, Julissa Alvarez, Victoria Castrejon, Madelyn Martin, Emily Rawley. 4x200 relay 6, 2:01.67, Alvarez, Emma Bocook, Rawley, Castrejon. Okanogan boys - Chet Craigen 1, shot put, 52-4; 1, discus, 148-4. Coleton Schreder-Guerrette 2, shot put, 41-7 PR; 5, discus, 118-9 PR. Heflin Robertson 5, high jump, 5-4 PR. Rajah Britton 7, high jump, 5-4. Sheldon Fields 2, 100, 11.50 PR; 2, 200, 23.80 PR. Justin Watts 3, 100, 11.58. Calvin Yusi 6, 200, 28.84 PR. Clancy Andrews 7, 3,000, 10:03.83. Levi Veenhuizen 5, 300 hurdles, 46.73 PR. 4x400 relay 1, 3:39.62, Julian Cates, Veenhuizen, Watts, Fields. Okanogan girls - Myra Rasmussen 1, 400, 1:02.11; 4, long jump, 15-5. Allie Eastridge 1, shot put, 37-10; 2, discus, 105-9. Kendra Sachse 1, javelin, 146-9, PR; 2, long jump, 16-00. Lindsey Streeter 2, javelin, 100-6. Renea Taylor 2, 200, 26.57 PR. Lexi LaDoux: 2, 3,000, 11:26.79 PR; 5, 1,500, 5:22.53; 6, 800, 2:34.60. Caitlyn Barton 8, 100, 13.37 PR. 4x100 relay 1, 51.05, Barton, Sachse, Taylor, Rasmussen. 4x200 relay 1, 1:48.33, Barton, Kendra Sachse, Taylor, Rasmussen. Omak boys - Israel Escamilla 1, 400, 53.05 PR; 4, 1,500, 4:22.51 PR. Tanner Sackman 3, shot put, 41-2.25; 2, discus, 131-00. Lonnie Cawston 2, long jump, 19-7; 7, triple jump, 39-1.5; 9, javelin, 128-2. Caleb Richter 6, shot put, 39-3.5 PR. Steven Zandell: 9, 3,000, 10:35.84; 8, 400, 55.34 PR; 10, 800, 2:18.01. Evan Porter: 9, 800, 2:17.66 PR. Omak girls - Emma Haeberle 1, high jump, 5-00 PR. Hanna Schneider 5, discus, 91-05; 9, shot put, 27-11.25 PR. Brooke Crosby 6, high jump 4-8. Estrella Delgado Lopez: 7, discus, 86-10 PR. Pateros boys - Dilan Martinez 17, 200, 30.94. Pateros girls - Anna Williams 3, 100, 12.81; 200, 5, 27.71; 400, 3, 1:03.27 PR. Sage Scott 200, 18, 32.49 PR; long jump, 19, 11-6, PR; 100, 25, 15.13, PR. Tonasket boys - Garrett Wilson 1, pole vault, 12-00; 3, javelin, 156-6. Carter Timm 12, 3000, 10:48.15 PR. 4x100 relay 6, 49.31, Julio Alatorre, Wilson, Michael Davis, Angel Depaz. 4x400 relay 9, 4:08.30. Alatorre, Depaz, Timm, Wilson. Tonasket girls - Sage Young 6, 400, 1:08.40. 6, 100 hurdles, 17.73. Araceli Torres 8, javelin, 79-07 PR. Katie Keane 9, 100, 13.46PR. 4x100 relay 6, 54.48, Young, Heidi Cruz, Keane, Cailee Denison. 4x200 relay 7, 2:02.28, Erica Breshears, Lilly Reavis, Brielle Wahl, Athena Rietveld. KITTITAS – Bridgeport competed at the K-Valley Rally on April 12 at Kittitas Secondary School. For the girls, Miriam Jimenez won the 3,200 in 15:07.19. For the boys, Ronaldo Ubaldo was second in the 110-meter high hurdles in 18.05. Ronaldo Ubaldo - 2, 110 hurdles, 18.05. Adrian Morales - 5, discus, 115. Alejandro Romero - 6, high jump, 5-2; 6, long jump, 17-6. Issac Ochoa - 2, pole vault, 9-6; 4, long jump, 18-4 PR; 3, triple jump, 36-3.5. Miriam Jimenez - 1, 3,200, 15:07.19. Anayeli Trejo - 9, 400, 1:18.59; 4, long jump, 12-8 PR; 8, triple jump, 24-2.5. Terri Martin - 7, 1,600, 7:26.37 PR; 2, 3,200, 16:05.34 PR; 2, 3,200, 16:05.34 PR. Karla Torres - 5, 100 hurdles, 21.662; 4, triple jump, 27-6. Yareli Palacio-Isidro - 2, shot put, 32-9; 3, discus, 94-6. Maritza Bravo - 8, shot put, 26-3; 9, discus, 75-6 PR. Bianca Torres - 4, javelin, 80-4 PR. Graciela Arellano - 7, javelin, 73-00. Sinai Espinoza - 6, long jump, 12-00.50 PR; 9, triple jump, 23-6.5. 4x100 relay - 4, 59.83, Monica Trejo, Jennifer Farias, Karla Torres, Esmeralda Garcia. 4x200 relay - 3, 2:01.42, Monica Trejo, Jennifer Farias, Josie Rios, Esmeralda Garcia. 4x400 relay - 4, 5:04.30, Anayeli Trejo, Karina Craig, Miriam Jimenez, Marsol Hernandez. SPOKANE FALLS – Lake Roosevelt, Republic and Almira/Coulee-Hartline found the going tough at the 2019 Nike-Van Kuren Invite on April 13 at Spokane Falls Community College. Sadie Trotter led the Raiders with a ninth-place finish in the 400 in 1:06.39. The Warriors were led by Maddie Murray, who took eighth in the 100-meter hurdles in 17.75. Taylor Connor - 8, high jump, 5-10. 4x200 relay - 18, 1:46.87, Jordan Starr, Korbin Forsman, Ian Hamrick, Taylor Connor. 4x100 relay - 23, 50.45, Jesse Beauchamp, Josh Faulkes, Ian Hamrick, Tristan Guilliot. Tristan Guilliot - 16, long jump, 18-3.75. Courtney Starr - 37, 3,200, 14:39.40PR. Tandice Fletcher - 37, 400, 1:15.92. 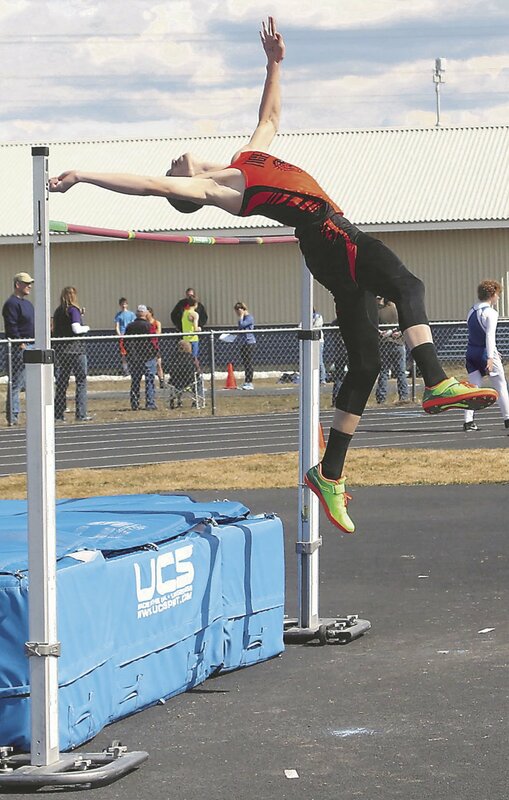 BRIDGEPORT – Five teams competed at the mid-week Brewster Co-Ed Relays on April 9 at Bridgeport. For Brewster, Geo Nila won the shot in 39-11, a personal record (PR). Alfredo Nila won the discus at 173-3, a PR. Teammate Ernie Nanamkin was second at 145-1. On the girls’ side, Bridgeport went 1-2 in the shot – Yareli Palacio-Isidra at 31-3 and Verania Velazquez at 29-9. Velazquez won the discus at 93-9, a PR. Palacio-Isidra was second at 88-5. Brewster’s Karste Wright won the high jump at 4-10.